McNaught Comet - spectacular spectacular! A bit off-topic, but for anyone in the southern hemisphere, make sure you don't miss the McNaught Comet. We're down in Tassie and caught it last night in Hobart. Big, bright and spectacular with a huge tail (apparently some 30 million km long!). You should be able to see it near the horizon some time after sunset - apparently brightest about an hour after sunset. If you read much about energy issues in the US, you’ll see common references to CAFE standards for cars. What are they? Are they a good thing? And should we have them in Australia? CAFE stands for Corporate Average Fuel Economy and is the sales-weighted average fuel economy of a manufacturer’s fleet of passenger cars or light trucks, manufactured for sale in the US in any given year. It’s measured in miles per gallon. The standards were first set in 1975, in response to the 1973-74 Arab oil embargo and the goal at the time was to double new car fuel economy by model year 1985. The standard for passenger car’s today (average economy of 27.5 mpg) is still the same as it was in 1985, although the standard for light trucks has been increasing. There are substantial penalties for failing to comply with the standards. Manufacturers who exceed their requirements earn credits which they can bank to offset any shortfall in standards in future years – or past years (up to 3 years). They cannot trade credits with other manufacturers. It is difficult to find non-partisan assessments of CAFÉ standards, but one seemingly relatively unbiased assessment is Effectiveness and Impact of Corporate Average Fuel Economy (CAFE) Standards (pdf), the report of a review undertaken by the Board on Energy and Environmental Systems, Transportation Research Board, and National Research Council. The CAFÉ standards have substantially improved fuel efficiency and reduced fuel use, resulting in current national annual petrol consumption 14% lower than if the standards had not been introduced. That’s a big figure. That improvement has come at a cost, however. The standards have led to slightly higher vehicle prices and slightly lower profits for car manufacturers. (To get an idea of how much: In a separate report, the Congressional Budget Office estimated the cost of increasing the efficiency standard to a level that would result in a 10% reduction in national gasoline use by cars. They estimated those costs at about $230 per vehicle. This includes the "dead weight loss" of reduced profits to manufacturers and reduced value to customers that would arise because the increase in vehicle price would mean that, at the margins, some people would not buy a car. It also incorporates the savings in fuel over the life of the car that buyers would enjoy - not quite enough to offset the increase in price. Note that the estimate is based on the assumption that manufacturers wouldn’t make any change to efficiency without the standard being tightened – I’m not sure if that assumption holds these days as fuel efficiency seems at last to be something that customers value. Relaxing that assumption implies a lower cost for achieving the same fuel reduction). In addition, (and I understand that this remains a controversial finding) the standards have led to an increase in traffic fatalities. This is apparently because the cheapest way to improve fuel efficiency is to reduce the weight of a vehicle and lighter vehicles have higher fatalities in collisions with heavier vehicles. My understanding from fairly brief background reading is that this has been exacerbated by the fact that heavy vehicles (such as 4-wheel-drives aka SUVs) are exempt from the standards, so these vehicles have not become any lighter, while lighter vehicles have become substantially lighter. You could expect that a reduction in the weight of all vehicles would not have an effect this negative and measures that reduced the weight of heavier vehicles could be expected to reduce fatalities. Obviously, this is a complicated issue with a lot of factors involved. The exemption for heavier vehicles has undermined the effectiveness of the scheme. Allowing manufacturers to trade credits would allow fuel efficiency improvements to be made at a lower cost and provide an incentive for manufacturers who already meet or exceed the standards to make further improvements. Higher fuel taxes may be a more efficient way to improve fuel efficiency and reduce fuel consumption. A key advantage of fuel taxes is that they influence not only fuel efficiency but also drivers’ behaviour, so they have a much broader effect on reducing fuel consumption. And because they apply not just to new cars, they can start influencing fuel consumption immediately. Given that cars are replaced only every few years, it can take several years for fuel efficiency standards to start having much effect on national fuel consumption. Should they be introduced in Australia? Most of the arguments about whether they’re a good thing in the US apply equally in Australia. No doubt they would increase fuel efficiency (by definition) and reduce fuel consumption. However, it is likely that they would increase the costs of cars to consumers and presumably raise traffic safety concerns. The big one is fuel taxes. Australia’s petrol taxes, while low by international standards, are considerably higher than in the US. This means that fuel-guzzling is not as attractive in Australia as the US and so fuel economy standards will not make as much of a difference to fuel consumption here. Higher fuel prices already provide some incentive to consumers to buy more efficient vehicles. CAFÉ standards, it should also be noted, are an important ‘second-best’ solution in a country such as the US where fuel taxes are politically unpopular. Getting at the solution more directly, by higher fuel taxes, would reduce fuel consumption more quickly and probably at a lower cost to drivers. The other difference between Australia and the US is Australia’s consumer clout – or lack of it. The US is a massive market for cars. It can be expected that manufacturers would invest in changes to their vehicles in response to standards there. That is less likely in response to Australian standards. That doesn’t mean that standards in Australia wouldn’t do anything: primarily they would change the mix of cars that manufacturers sell here. But they would be unlikely to lead to manufacturers investing in making their existing models more fuel-efficient. But then again, US, Asian and European markets already provide that incentive so it’s probably not a big deal. Who’s to blame for the ‘housing crisis’? There’s been a lot of talk recently, in the Sydney Morning Herald for example, about that perennial favourite of economic topics, home affordability. And someone always mentions property taxes. In 2000 the Government sparked a frenzy of investment in property after it halved the tax paid on capital gains, while keeping the negative gearing loophole open. Earlier it had introduced a superannuation surcharge for high-income earners, which also increased the relative appeal of property. As investors rushed into the property market, they fuelled an explosion in building activity [and] home prices… the halving of capital gains tax and the loophole of negative gearing was the main reason for the speculative boom in investment properties. I call on all the state Labor governments to cut stamp duty on conveyancing now and make housing a whole lot more affordable for first home buyers." So which is it: do tax breaks on property encourage more investment in housing, which increases the price or do high taxes on property increase the cost of housing, which increases the price? Surely it can’t be both - or am I missing something here? As I suggested last week, I’m planning to have a weekly roundup of interesting blog posts from the week on environmental and economic issues – concentrating particularly on Australian issues and on issues that are both environmental and economic. Economist Harry Clarke outlines some of the benefits of water restrictions but argues that increasing prices would give the same benefits without the arbitrary side-affects. (This is something I talked about a couple of weeks ago). Harry also deals with the concern of charging high prices for water to people on low incomes and offers some solutions. Earlier in the week, Amy Stodghill talked about the apparent waste of providing chunky paper phone books to every household and business in the US. I asked Telstra / Sensis about the position in Australia. The discussion has struck a chord, with Grant Young and Andrea at Buy Organic adding their thoughts and Sven Cahling talking about the situation in Sweden (for anyone who can speak Swedish!). Sydney to ship in drinking water? Five years ago Solar Sailor won an Australian Design Award for its electric catamaran, often seen plying Sydney Harbour. 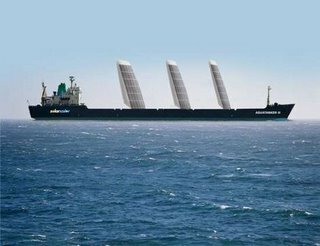 With rigid sails covered in solar cells, the boat catches the wind when it blows, or generates power from the sun when it shines. If the conditions are right, it can use both. North-west Tasmania had abundant water, he said, in hydro-electric dams just 15 kilometres from the coast and only a short sea trip from mainland cities: "The water is used once for hydro electricity. It is not used for irrigation or feeding a town." Within 18 months a 50 billion-litre-a-year supply could be operating, using two conventional supertankers each ferrying 330 million litres to Sydney, the Central Coast, Melbourne or Queensland "just like delivering oil". Within five years specially built electric tankers, each carrying 500 million litres, could be plying the routes. The ships would be powered by rigid solar sails, coal-fired electric motors, or both. The company proposes exporting up to 200 billion litres of Tasmanian water a year for 20 years, enough to supply almost a third of Sydney's needs. The ships would moor on the horizon off Sydney and the water would be pumped through undersea pipes to Kurnell, then into Sydney's water supply. It would cost about $1 a kilolitre, including a 30 cent-a-kilolitre royalty to Tasmania for water otherwise "going to waste". I happened to be walking in my neighborhood and noticed a few guys frantically running to and from a slow moving budget rental truck. They were distributing stacks upon stacks of brand, spankin' new phone books. No stoop was left behind - every single residential door was graced with updated contact information for the entire borough of Brooklyn. Now, can you tell me when was the last time you flipped through the yellow pages to look up a phone number? I understand this is a community service thing or paid advertising or something altruistic - but in our digital age (we'll suspend the e-waste topic for this posting) is this tower of telephone books really necessary? Even though they are made on paper that contains "up to" 40% post-consumer recycled material, what if they weren't printed at all? Or what if half as many were printed? Good question. Aside from the environmental cost, distributing printed yellow and white tomes to every home and business in Australia must represent a huge cost to their business. Wouldn't you want to reduce that if you could? In Australia, the phone books are produced by Sensis (a subsidiary of Telstra). They have a phone book opt-out: you can call them on 1800 810 211 and request not to receive one (and I'd encourage you to do so) but that seems a pretty inefficient way to reduce the number of phone books distributed - how many people know about (and will bother) opting out? I've asked them if they're taking any other measures to reduce the number of phone books they need to produce and distribute and I'll let you know if I receive a response. Sensis has replied - see the comments below. Splitting of the metropolitan White Pages into Business and Residential volumes, and only delivering the Business section to business customers. If they want a residential section, they can ring up and order one. Reduction of business delivery numbers through asking a representative how many copies they require at the time of delivery. Directories are delivered to secured apartment buildings and calling cards left in each residence’s mail box. If the directories are not collected within 14 days, they are collected by Sensis and re-distributed elsewhere. Refining of print orders based on each year’s distribution figures for each area. Another point they make is that they are required by the government to deliver a printed directory to every household as one of Telstra's licence conditions. Sure, Telstra should provide phone books to people who need them, but this seems to go way beyond what the community needs. What do you want to see on Oikos? I’ve been thinking about the content on Oikos and I’m wanting to make it more regular and predictable. Highlight dodgy reporting and analysis of environmental issues. Clarify my own thinking and educate myself about economics and environmental issues. Since I’ve started there are quite a few more Australian blogs that discuss these issues from time to time, which is great. A weekly round-up of posts from Australian blogs that have looked at environmental issues from an economic point of view, together with any particularly important environmental economics news stories and overseas developments – probably on a Friday. I’m also interested in other areas that raise similar economic issues to the environment – public health, for example – and will start to write a bit on those issues. What would you like to see on Oikos this year? What issues are you most interested in? Any comments and suggestions would be most welcome. How do we resolve environmental disputes? A lot of environmental disputes are conflicts over resources and, underlying them, are conflicts over values – which of two things is more important. A browse through environmental news stories this morning gives a number of examples. In the US, the Fish and Wildlife Service has granted approval under the Endangered Species Act for a windfarm to operate even though it is expected to wipe out 5% of the global population of the critically endangered Puerto Rican Nightjar (story via NeoCommons). In NSW, the State opposition has called for national parks to be opened up for grazing to help farmers during the current drought. Here, a land use conflict is at its core a conflict between income for struggling rural communities and the protection of fragile, rare and / or biologically important ecosystems. And at a national level, the federal opposition states that, if elected, it will buy irrigation licences on the water market to improve river health. Farmer groups oppose this idea, as it will raise the price of water entitlements and mean less water used for agricultural production. Again, this is a conflict between using water to boost farm incomes or to improve the health of river ecosystems. I’m just as interested in the processes and methods we use to resolve these conflicts as I am in the issues underlying the conflicts. My interest in economics stems from the fact that I think it provides a particularly useful set of tools for resolving resource use conflicts. One of the powerful aspects of market systems is they allow us to resolve disputes by comparing apples and oranges. What is more important? Reducing carbon dioxide emissions by x megatonnes per year (by building a windfarm) or protecting y hundred critically endangered birds (by not building a windfarm). These are analogous to the disputes that markets resolve every day. Should our society invest more money in IT, pharmaceuticals, agriculture, resources or manufacturing? This is a decision that no-one could hope to make – and no-one has to make because millions of individuals make their own decisions about where to invest their money and labour. Some new land is released in western Sydney. What should we build there? How many houses, how many shopping centres, how many factories, how many schools and hospitals? Well, governments make some of these decisions and guide or restrict others, but mostly these decisions are made by households and businesses. Would we be better using the Hunter Valley for coal mining, wine production or cattle? Well, mostly miners, farmers and grape growers can decide for themselves which land they’re prepared to buy. Of course the trouble with our bird and windfarm problem is that the Puerto Rican windjar can’t buy up the land to protect their homes. Nor realistically can the residents and wildlife of places around the world particularly affected by climate change each pitch in a bit of cash to buy the land for the windfarm. Someone has to make a value call here: what is worth more? X megatonnes carbon dioxide or y hundred Puerto Rican Nightjars? But we should always be on the lookout for tools that will make this decision easier, that will avoid what are essentially arbitrary value calls like this. Can we delve deeper? I don’t know much about the background of this US case, but in a similar Australian conflict last year there was a simple solution. In that case, a proposed windfarm would kill, on average, one bird every 100 or so years. In a global population of only 150 birds, the federal Environment Minister decided that impact was too high and refused to let the windfarm go ahead. However, the birds can be bred in captivity relatively cheaply and then successfully reintroduced into the wild. A condition that the windfarm pay for a breeding program suddenly changes the equation from the unresolvable "Which is worth more: one bird saved versus x megatonnes of emissions saved?" to "Which is worth more: one bird saved versus 20 birds bred and reintroduced and x megatonnes of emissions saved?" – a question that is much easier to answer. Of course, many or most environmental conflicts do come down to conflicts over values that can’t be sidestepped. But when we can sidestep them, we should. Requiring developers to fund measures that counteract the negative environmental impacts of their developments, where practical, means that government decision-makers don't need to make invidious jobs-versus-environment value judgements. WHILE other states are tightening water restrictions… NSW is steadfastly refusing to do the same, preferring to spend $1.3 billion to build a desalination plant. Dam levels are at a historic low of 36.4 per cent and will receive only a small boost from this week's rain. The Government has said it would go ahead with a desalination plant at Kurnell if the dams fell to 30 per cent, which is likely to happen soon after the state election on March 24. Asked why restrictions could not be tightened to slow falling dam rates before March and April, when rainfall is heaviest, the Water Minister, David Campbell, said it would send a mixed signal to the public. "The community is accepting the position at the moment; they are doing the right thing," he said. "I don't think we need to send [sic] an air of panic. We have got a [Metropolitan Water] plan … which indicates we can secure Sydney's water supply without going to draconian water restrictions." I have mixed feelings about water restrictions. Economic theory suggests that a more efficient way to deal with water shortages is by increasing prices (or, better, letting prices find their own level). Higher prices will encourage more careful use of water, but people will find the way to save water that best works for them. For some people that will be shorter showers, for others less water for the garden, for others washing the car less often. Over time, people will adjust in bigger ways: installing water-saving shower heads; reducing the size of their gardens and using more drought-tolerant plants. I was at my Dad’s place in Canberra a few weeks ago and the bird bath – usually frequented by a number of native birds – was empty. Apparently Canberra’s water restrictions prohibit the filling of backyard water features because they lose a lot of water through evaporation. That seemed rather a shame to me, especially as I’m sure it’s a tiny fraction of his overall water use and there’s so many other ways he could cut down on water use. Any system of restrictions is inflexible, a ‘one size fits all’ prescription. On the other hand, I think water restrictions can be useful in changing the way people think about water use. Economic theory prefers to let prices do their thing in encouraging behaviour changes because that will allow people to choose the behaviour changes that best fulfil their needs – and different people have different wants and needs driving their water uses. The most efficient solution is allowing people to make the choices that best fulfil their desires. But this partly rests on an assumption that the desires that underpin people’s choices are fixed and given. And this is not necessarily the case. The thing is, water restrictions may not just stand in the way of people attaining their preferences, they may actually change those preferences. By signalling that we as a community are concerned about water use and want to limit it, that may just change my desire to have a big green lawn to show off to my friends and neighbours. But is this something that could better be achieved by, say, educating people about the fragility of our river systems, than making people hose their gardens rather than use sprinklers? ABC's 7.30 Report had a story on this issue last night. The transcript (not yet available as at 9 am) will be here. Larvatus Prodeo had a discussion on this issue overnight as well. Oikos has been silent for some weeks now as work and the silly season swamped me - and then I had a holiday! Anyway, I'm back and refreshed and Oikos will be back to regular posting (I'm aiming for daily). A theme of interest this year will be markets: When do they work? When do they not work? What do they do well? What do they do badly? Environmental protection is something they generally don't do well, but why? And is this always the case? Can you create artificial markets in environmental services and how well do they work? What makes a good one?